In an era where quarterback is far and away the most valuable position in the sport, a man who was drafted in the top 10 at the position less than a year ago is supposedly available via trade. How did we get here with Josh Rosen? To answer that, we need to examine what’s occurred in Arizona over the last year as well as take a look at what the market looks like for quarterbacks. At this time a year ago, the Arizona Cardinals were not planning to hit reset. Despite a roster that had been trending downwards since their successful 2015 season, GM Steve Keim was unwilling to blow it up. The Cardinals were major players in free agency, nabbing Sam Bradford at quarterback, Justin Pugh along the offensive line, and Tre Boston at safety. Deep down though, it was quite obvious that Keim knew that wouldn’t be enough. When Josh Rosen fell all the way to the 10th pick in the draft, the Cardinals jumped up from 15 and got their guy. What happened since has been Jared Goff-esque levels of incompetence from Rosen’s surrounding cast. Offensive coordinator Mike McCoy was fired midway through the season, and interim offensive coordinator Byron Leftwich’s playcalling was hamstrung by the worst offensive line in the NFL by PFF’s grading. As such, Rosen limped to an unspectacular 49.1 overall grade in his rookie season. The Cardinals finished with the worst record in the NFL at 3-13 and now control the number one overall pick. Head coach Steve Wilks was fired after the season and replaced with the similarly-fired former head coach of Texas Tech, Kliff Kingsbury. It’s safe to say the reset button has been pushed. That reportedly leaves Rosen as an expendable commodity. The ‘college’ concepts that Kingsbury brings to the table were quite obviously run at a higher level by Heisman trophy winner Kyler Murray than they were by Rosen at UCLA, but should they really cut bait after one season? The obvious answer in this situation should be: yes. It’s important to remember that this has nothing to do with Rosen, and everything to do with their prior evaluations. I don’t care what team you are, if you are in a position to upgrade the quarterback position – with how valuable even slight incremental differences can be – you do it. If the staff has a higher grade on Murray or even Dwayne Haskins or Drew Lock, they should pull the trigger. This is obviously easier said than done, but it’s important to remember that it has nothing to do with ‘giving up’ on Josh Rosen. His rookie season falls somewhere on the Goff/Trubisky spectrum in terms of simply throwing it out the window for evaluation purposes. This was the fourth quarterback selected in the 2018 draft though; three other teams that drafted quarterbacks (Browns, Jets, Bills) quite obviously did not have Rosen as their top guy. Two other quarterback-needy teams in the Giants and Broncos didn’t think Rosen was a franchise-type guy either. 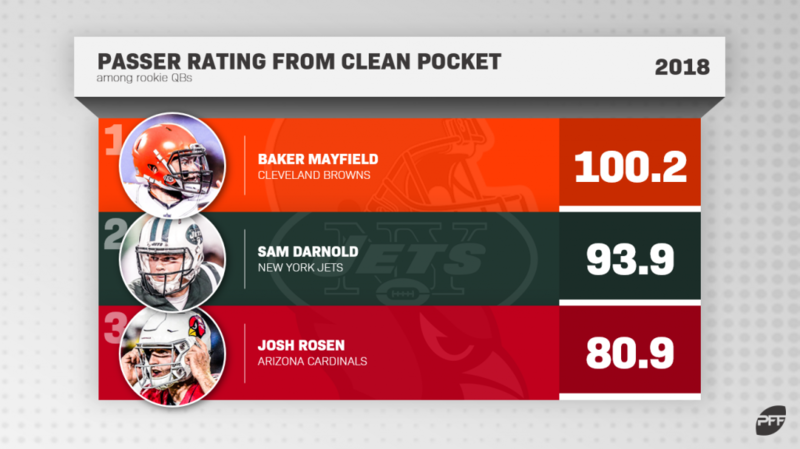 This obviously doesn’t prove anything for Rosen’s career going forward, other than a handful of other teams didn’t have super-high grades on the now-Cardinals quarterback. That’s what makes the trade market for him tricky. If you had a first-round grade on Rosen a year ago, should you be willing to give up a first for him now? While there’s evidence that it’s not a death knell, Rosen’s dreadful rookie year should impact your valuation of him for a couple of reasons. The first is that he’s already burned a year of deflated price control. The second is that the odds simply aren’t in your favor. While there have been exceptions of late, the vast majority of the top quarterbacks in the NFL were at least average in their first season of starting experience, while the majority of the ‘elite’ quarterbacks performed well above-average. That’s a bad list. Goff is obviously the dream scenario, but there’s a laundry list of first-round busts that should give pause. 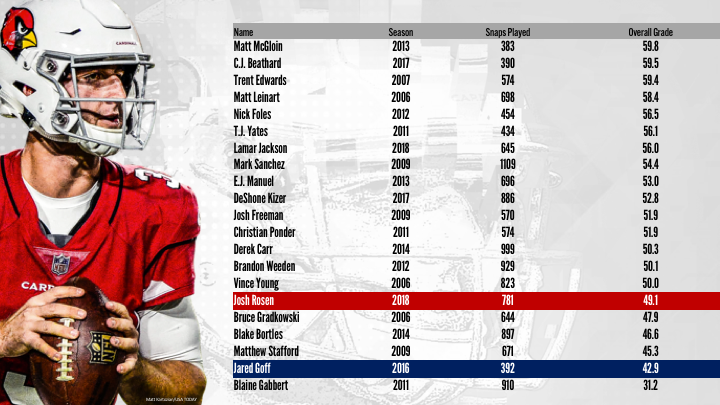 Even guys like Derek Carr and Matthew Stafford, who turned it around after their rookie seasons, still haven’t exactly been consistent over the course of their careers. Any potential trade partner looking at this list should be given pause for thought. Just as the way the Packers were the suitors for second-round pick DeShone Kizer last year, pretty much anyone could be a potential fit for Rosen. The Broncos, Dolphins, and Redskins are all in the immediate-quarterback market with draft slots that might not allow them to get one. The Bengals, Raiders, Bucs, and Lions could all be in the supplementary-quarterback market. The Steelers, Chargers, Saints, and Patriots could all be in the groom-the-quarterback-of-the-future market. It will all come down to price. The possibly inflated evaluation and the dreadful rookie season could see many unwilling to part with the first-round pick that the Cardinals covet. At the end of the day though, Arizona has to go with who they believe is the best player available to them at quarterback, and not worry about the compensation in return.